IlyaM: Given this position how to punish this non-joseki move? I've seen it being played by my opponents several times. From my games it looks that I have to spend another move at 'a' or white takes this point an black corner gets in trouble. But if I spend a move here at 'a' white can attack marked black easily with 'b' or 'c' (easily = I don't know good reply). Bill: Don't worry too much about them. Both are poor attacks, as a rule. If Black does not have a good extension or jump on the top side after Wb or Wc, it is usually easy to throw away. Then the exchange, - Ba, would look silly. I tried GoBase search and according it there are only two games where this non-joseki move was played (update - actually one of these games matched the pattern by accident and it was not a joseki play at all but an invasion) . There must be a good reason why it is beeing avoided in pro games but unfortunately I've not been able to find good follow-up moves which "punish" it. Joonas Tyystjarvi: I think black needs a here. It seems to me that the purpose of played this way is to play a pincer against the circled black stone and start a running fight. Another move that might be worth considering is taking the corner with d, but I think that makes the fight easier for white. B and c are nothing to worry about. Against b, black can simply extend, against c the usual sequence makes look oddly placed (well, to my 2k eyes it does). 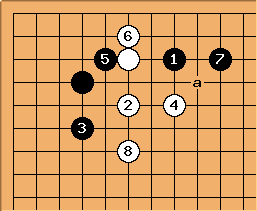 For reference, the following is joseki. 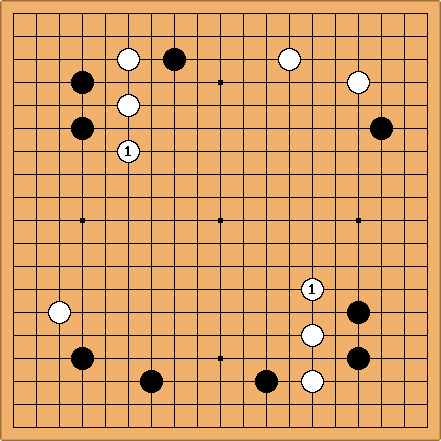 This way, white avoids fighting and makes a strong group in the center. Klaus: does not seem to be a serious mistake, so maybe it cannot be "punished". The reason why pro's don't play it might simöy be, that it is 1 or 2 point (less - IlyaM: missing word?) worth than some other joseki, locally. However, such high moves must be considered globally, rather then locally only, so we might need a whole board analysis. IlyaM: I understand that non-joseki move can make sense considering whole board position but the fact that this move practically doesn't exist in pro games whatever the global position makes me think that pros consider this move to be almost always bad. Given that this move is very common in DDK games I'd love to understand why. Bill: If double digit kyus are making such plays, I say more power to them. IMX, it is usually hard to get them to pay attention to the center or think on a large scale. unkx80: is not a "mistake", but is almost standard. 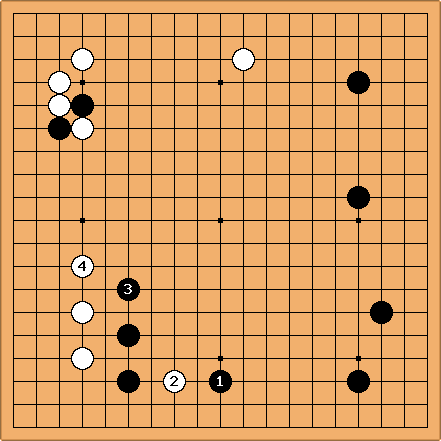 Allowing White to play at to seal Black in is usually too big. IlyaM: Does it make sense to put this diagram with unkx80's comment on 44PointOneSpaceLowPincerOnePointJump page? Bill: Locally, trading for in the Comments diagram is not so great, as extends along the 4th line. However, there are certainly whole board situations where is playable. 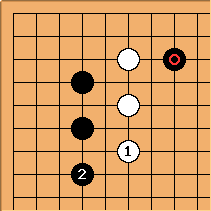 Here is a similar example from a game between Rui Nai Wei (White) and Aoki Shin-Ichi (Black), discussed in 21st Century Go, vol. 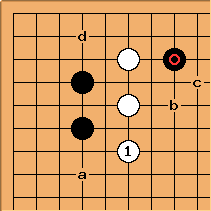 1 by Go Seigen, p. 166. Go Seigen has no comment about or , but thinks that is too close. 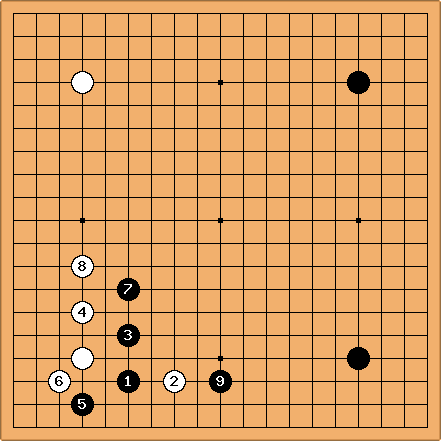 Go Seigen recommends this continuation, with a 2-space pincer. Note that Black does not fear the exchange, - .